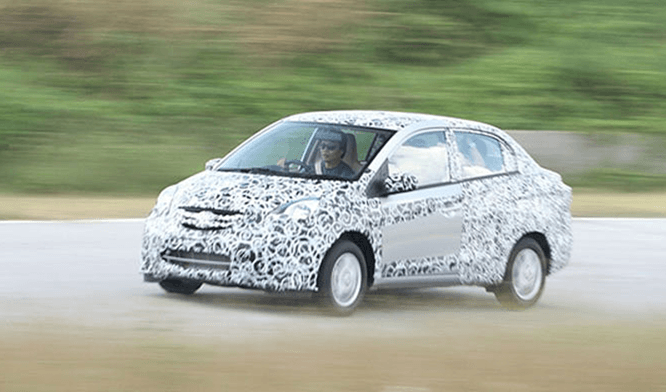 Some time back we brought you the official teaser image of the Honda Brio based sedan from the company’s Thailand website (click here to see the image). 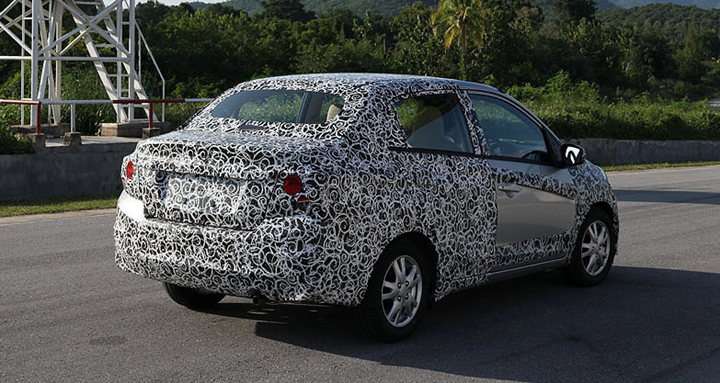 Today we have a spy picture of the Brio sedan which was caught while testing in Thailand. 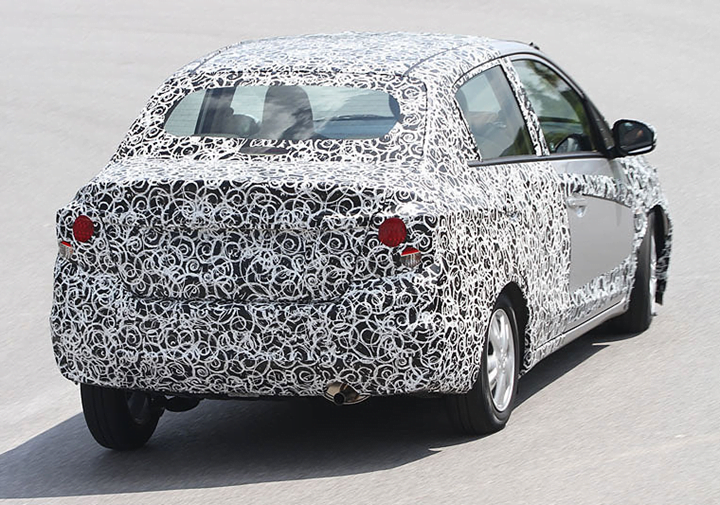 The only reason for our disappointment is that the car was spied from the rear only and not from the sides and front. 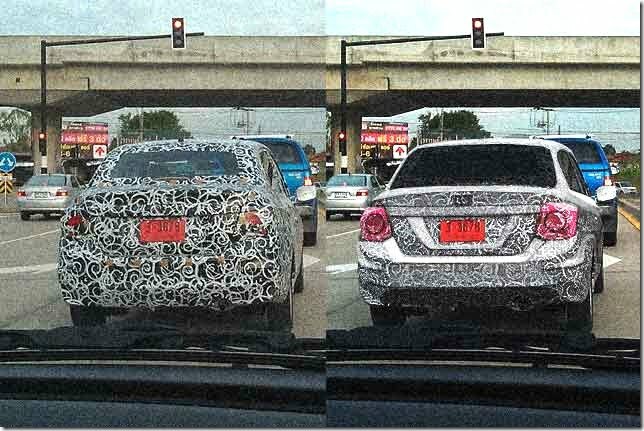 Further, the car was heavily camouflaged meaning very few details can be noticed from the picture. The actual picture (on the left) does not tell anything about the rear, but the retouched picture (on the right) does highlight the rear. 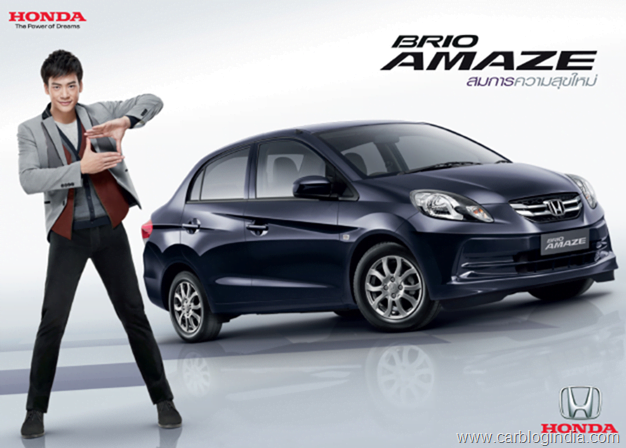 However, we already have a considerable amount of information on the Honda Brio sedan. First and foremost. 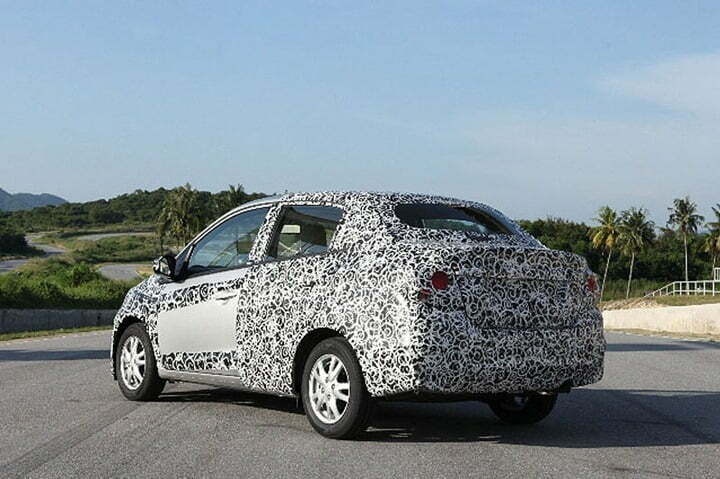 the car is codenamed Honda 2TP and is expected to be launched in India and Thailand in 2013. As we mentioned in our last post on the Brio sedan, it could become a huge success for two reasons: Firstly the Indian market gives excise benefits to car measuring less than 4 meters, and importantly the Brio sedan will be a sub-4 meter vehicle. And secondly, the car will need a diesel engineto gain good sales and since Honda is already working on a small capacity diesel engine for Brio, Jazz and City, no doubt the sedan version will be powered by this engine. 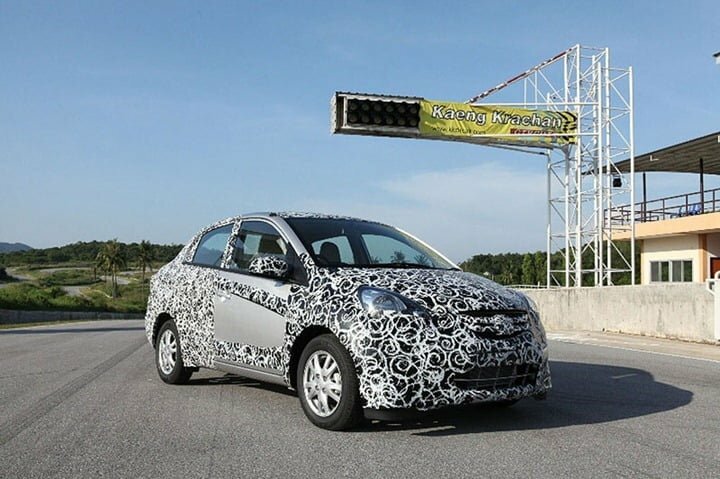 Also Brio sedan will be first model to get the small diesel engine being developed exclusively for India. The engine will inherit the DNA of the 1.8 litre ‘Earth Dreams’ diesel engine sold in the UK. But it will be a 1.5 litre unit with less number of cylinders. Design wise the Brio isn’t something extraordinary and is the normal Brio but with a boot added. This practice is very common in India and popular too, and some such examples are Etios Liva and Etios twins, Swift and Swift Dzire twins, Micra and Sunny, and so on. As per the latest reports from Team-BHP forum, the Brio Sedan will be named with a 5-alphabet name and it maybe named as Honda Amaze. The Honda Amaze will feature first diesel engine in India which is a light weight all-aluminum construction engine and will deliver a mileage of close to 24 KMPL as per the ARAI figures. 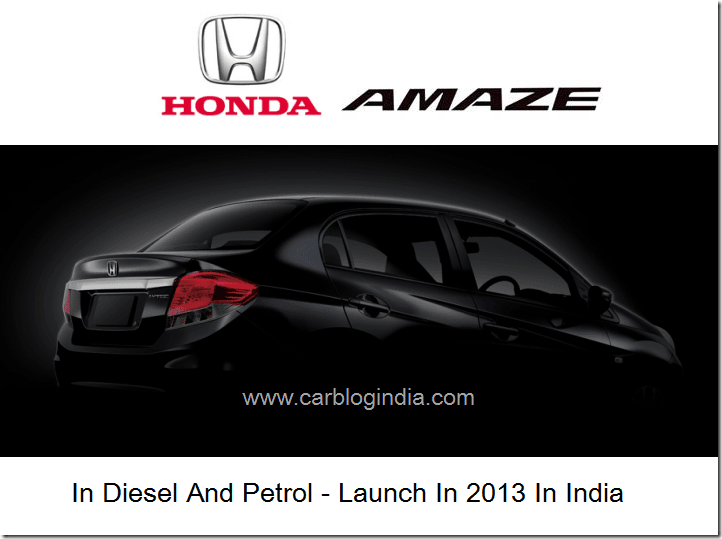 We will keep an eye on the developments and will keep you posted, stay tuned to Car Blog India. Honda has officially announced that it will be launching the Honda Amaze compact sedan in Thailand on 23rd November 2012 and it will be launched in India in FY 2013-14 which means anytime after April 2013. For Thailand, the Amaze will be launched only with petrol engine options however for India, it sill be offered in both petrol and diesel. Honda has also announced that they will price it competitively by increasing the local sourcing and production. Higher localization levels will allow Honda to keep the costs low and compete well with the segment leader Dzire. Honda has designed Amaze with compact exteriors and spacious interiors with their M/M – man maximum, machine minimum concept. Like the Brio compact hatch, which has been developed specially for Asian markets, the Amaze will also cater to the needs of Asian markets and will help Honda enter the sub-City sedan segment which is quite high in sales potential across Asia. We will bring you all the details form the official Thailand launch on 23rd November 2012, stay tuned to Car Blog India. You can also bookmark this page and come back later for updates.